At their December meeting, NVAHA’s Leadership Council had a lengthy discussion about Amazon and its impact on housing affordability. Since the November 13 announcement by Governor Northam regarding Crystal City’s selection as one of two HQ2 sites and the details around the state’s incentive package, there’s been an avalanche of commentary and analysis by elected officials, economic development consultants, and political pundits. The purpose of our meeting was to separate some of the more hyperbolic rhetoric from the facts; to have a reasoned conversation about what is known; and what Amazon’s presence means for Northern Virginia, especially with regard to housing. Jobs are coming; half with healthy salaries. Amazon will invest approximately $2.5 billion to establish a new headquarters in Crystal City and create 25,000 jobs – half in the $150,000/yr salary range, and half devoted to administrative positions, HR, or custodial staff. Salaries for these support positions have not been disclosed, but it is safe to say they will be lower than the top tier. Virginia committed approximately $200 million for five multimodal transit improvements. 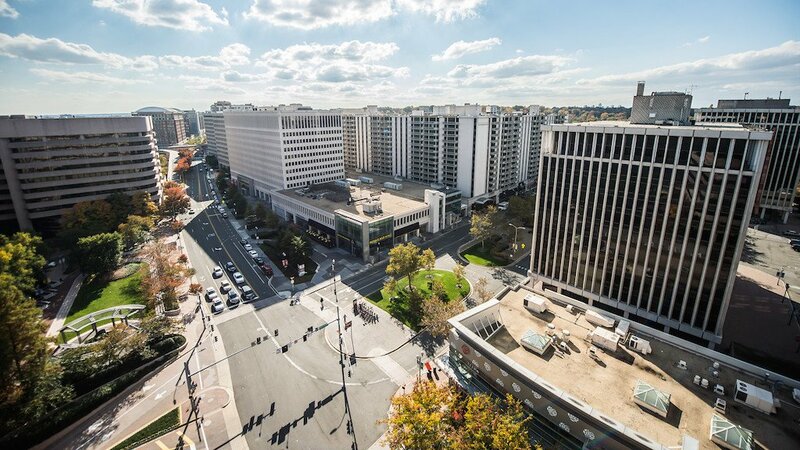 These include new entrances for metro stations in Crystal City and Potomac Yard, a pedestrian bridge from Crystal City to Reagan National Airport, and improvements for pedestrian access along the Route 1 corridor. Innovation Campus will be a hub for tech talent. Virginia Tech (with state assistance) will develop a campus in north Alexandria for college and post-graduate students to build and maintain a bench of tech talent and ensure a pipeline for the tech workforce that Amazon needs. This element of Virginia’s proposal was a game-changer, sealing the deal for Northern Virginia. It also advances a long standing goal of economic development experts and the business community throughout the DMV. There’s much to cheer in the Amazon announcement. New (non-federal) jobs establish our region as a tech center, and the Innovation Campus, with the goal of substantially increasing a tech-skilled workforce, will attract more diverse and innovative industries. Major investments in our transportation infrastructure will provide a much needed boost to metro, increasing mobility for us all. Virginia’s proposal to Amazon touted Arlington and Alexandria’s financial commitments to affordable housing by highlighting their local housing trust funds ($150 million over ten years), but additional resources will be needed. Currently, each jurisdiction is losing market-affordable housing at a rate of approximately 1,000 units each year, and neither Arlington nor Alexandria have met the annual goals adopted in their affordable housing master plans. Amazon’s presence in Crystal City will put redevelopment pressure on older, market-affordable neighborhoods that provide housing for hundreds of low-income households in the Arlandria and South Arlington communities, but the market-affordable housing stock at Bailey’s Crossroads and Seven Corners in Fairfax County, just a few miles away, is also at risk of loss if owners chose to sell to meet the demands for new rental housing for Amazon’s workforce. Shortly after the Amazon announcement, the Virginia Housing Development Authority (VHDA) pledged an additional $15 million annually for five years in REACH funds to Northern Virginia. This funding acknowledges the housing component of the economic development opportunity of Amazon HQ2, aligning with the 2017 Governor’s Housing Policy Advisory Council’s report on the strong linkage between housing and economic development. VHDA has also pledged to meet with its Northern Virginia development partners in the coming months to discuss additional resources to support housing. Acknowledging the link between economic development and housing provides a strong rationale for a substantial increase in the state’s housing trust fund. Our petition campaign makes the case for an increase to $20 million annually. The current annual allocation is $5 million, and this is woefully inadequate given the housing needs HQ2 brings, and the ensuing increase in tax revenues that the state will enjoy. Increase Housing Supply: It is well documented that housing supply is not keeping up with demand in the DMV. As a region, we must be more resourceful and creative to increase the supply of housing stock, allowing new housing types to be constructed in our communities. Use an Equity lens: In all that we do, we must ensure that everyone can fully participate in the growth and prosperity that HQ2 brings to the region. That requires that we identify and eliminate those systems, practices and policies that discriminate against people of color. Amazon’s announcement did not create a housing crisis; it simply underscored what we already know – housing costs too much in our region, and those costs are a threat to our ability to grow and prosper. The DMV is not Seattle. We are larger and have a higher baseline of economic activity – 3.3 million jobs vs. 2 million jobs in Seattle. Our land patterns are less sprawling; we have more compact, dense development.